I also took that time to "inventory" (Minimal glance, nothing substantial that included opening the tubs on my book case....) of my UFO's, WIPS, & PIGS. (UFO = UnFinished Object, WIPS = Work In ProgresS, PIGS = Project In Grocery Sack) Those definitions vary by the person but for me a WIPS is something that I am actually working on right now, A UFO is something that I have worked on in the past - incl. about 4 items that just need BORDERS, and a PIGS is something that I haven't actually started beyond gathering patterns and fabric. Anyone interested in the number of projects on my spreadsheet? I have already logically minimized my list, because some of the items on my list are secondary & tertiary projects - those will be made using the scraps of other projects! Therefore, I could logically only work with Pink, Brown, taupe, hot pink, orange, & Raspberry (My text color selections are far to limited...) and make about 13 quilts! You see, I plan to make Quiltville's Star Struck with pink, brown & cream and then use those scraps to make a Lady of the Lake quilt (only simpler than that one & maybe less scrappy - oh I probably should have warned you about that, huh?) 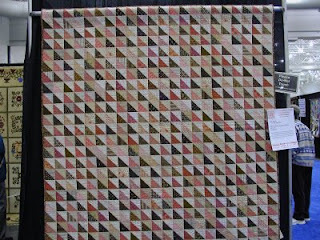 & a charm style quilt & maybe even use the scraps I generate form those with some of my taupe scraps to make a HST quilt like this one seen last year the the Mid-Atlantic Quilt Show. Note: Taupe is a style of fabric not a color - you can see what I mean at Pinwheels. HMMMM Something to think about while my inner dandylion takes flight to another project/idea/theme/etc. For my first question about the Jan Mullen prints & the Turning Twenty around the Block pattern, I auditioned a few cat fabrics. The bright & funky ones look best. I will frame them with a black print to help separate the cats from the other fabrics... I am going to do the 30 block layout & I have at least 30 bright & funky cat prints! What would you put in the centers? 3. a variety of cats that sort of match like this one, or this one? I got this fabric brown with small flowers & 5 to go with it - including this one with a lot of white (I hope those hyperlinks show two different fabrics. ), so my pondering is this - in the book she mixed reds (pre-fabric line apparently) with plain white muslin & it is very effective; however, as you can see in the free pattern, she mixed limes & turquoises with brown prints. If you did not have the limes and turquoises & your mix of prints was on the brown side including this one in gold - what would you use with it? Muslin? Would that be o.k. with the polka dots on white? When I am home I like the internal temp. to be on the cool side of comfortable so that I can snuggle in a quilt (not exactly conducive to quilting, but....) with a couple of heat seeking cats! Yesterday, I worked while my husband stayed home. When I got home it was like a blast form a furnace! (Our condo fees cover the heating and air conditioning - so there is no direct correlation between 80 degrees in the condo and $400 on the bill. Thankfully from a budget standpoint but unfortunate also...) So the thermostat was adjusted and we went to bed. What did he get for Hanukkah? He got an episode ot Star Trek (The original one) "Trouble with Tribbles" in the form of a bucket of sparkly balls! Sensory overload for my little boy, but cute none the less. On a quilty note, at my LQS they sell a coupon book in January for the full year. The first coupon will pay for itself - it is a "Create your own Special Day" (Save 25% off all regularly priced merchandise.) coupon... YAY! But the last coupon is similar - save 25% on 1 item over $100. I am on the precipise of the latter coupon for 2006... I also have about $75 in gift cards. The more I think on it the more I think I will pass on using it (this year). So I can hold onto my GC's for the summer time when I want/need some inspiration or just some retail therapy! Before 01/01/07 I am going to make a spreadsheet of all of my quilting projects. I will then concentrate on working on & completing those in 2007. Hopefully limiting my quilty purchases greatly. Not completely, but significantly. We already have hotel reservations in nearby Yorktown, Va. as an anniversary gift from my friend. We are also going to use restaurant gift cards on the way home at a fancy schmancy place on Maryland's Eastern Shore, in St. Michaels. Hopefully my speadsheet will also illuminate those areas in my stash that do not need enhancing, so that my little dandylion shopper will not buy them just because, "I really like blues & yellows." I liked them when I bought them! I know this post if anything was flittery fluttery from here to there and back - its the dandylion in me! What will they think of next? tampon crafts apparently. (The link will bring you to Hanukkah, but this is an equal opportunity craft, complete with "on-point" captions - take a look it is not as gross as you "think.") Be sure to click on all of the highlighted words! "Hey What are you looking at?" (The letter shown on the Dreidel is - "Hey") Outside of Israel, the other letters are Nun, Gimmel, & Shin. The represent the Hebrew words - Nes, Gadol, Haya, Sham. In English that means, "A great miracle happened there." In Israel, they substitute the Shin with a Pay which then represents the word Po for "here." I hope that link works... It is timely at any rate. Completely not what I wanted/had in mind, but it would work in a pinch. To begin, No this is not a new quilt. Rather it is a seasonal quilt. With it being Hanukkah, there is no better time to display/share/use a Chanukah Quilt. I'll start with the back - well just a corner of the back - it is all made out of this lovely cat flannel. Meow! Cool binding too, huh? I love to use stripes as bindings - especially when that are not "regular" like a perfect pin stripe. Hanukkah Sameach - Happy Hanukkah in Hebrew - TOO COOL! I was so excited when I saw that. Do you have a piece of fabric that you LOVE but have no idea on how to use it. (Like a large scale cat, just as an example.) Check out these ideas from QNM. Once upon a time ago, I had a subscription to the magazine, but it was not "me" - it still isn't, but everyonce in a while there is something that catches my fancy... I really like the condensed version online - it is kind of a "best of" version. Hey we all know the best part - it's free online! Not unlike Morah & Nancy, not much is going on in this corner of bloggerville. I have been in the stewdio - I pressed those plaids that I am toying with. Oh & I figured it out - officially I am a dandylion - I flit from one thing to another and from one genre to another all the time! Basically what I am saying is that writing down my goals did not help..... (Maybe if I could figure out that list thing that a lot of ya'll bloggers have going - complete with the strike outs....) Maybe if I was less like a dandylion skitting from one thing to another.... That would include some "Prioritizing." Since only one of my UFO's is an official gift - that priorties would only be in my head & easily "moved around" thus again allowing my to flit to & fro. Finally, I leave you with a JOKE. Miriam was on vacation in Israel and decided to go to the local post office to buy stamps for her Hanukkah cards. "I'd like, please, 100 hanukkah stamps," she told the clerk. "Not a problem. So what denominations?" he asked. "Oy Vay!" she exclaimed, "It's come to this already? Okay," she said, after giving the matter due consideration. "I'll take forty Reform, forty Conservative, and twenty Orthodox." (That would be roughtly equavalent to forty Baptist, forty Catholic, & twenty Greek Orthodox.) See it is a funny joke. Sorry for all of the shenanigan's, but I am trying out quite a few things just to see what my (our) options are! Well that did not work... While I can post from my e-mail (& you can too....) I can not "forward" actually "reply" & change the recipient address to share an attachment! Back to the drafting board! This is just a test to see if I can blog from my MAC (old) laptop... I tried before & was unsuccessful. I just switched to the Mozilla Firefox browser - maybe that will help. Once upon a time ago, some of us participated in "Project Spectrum." At that time, I shared some of my blue kitties (click to see them). I also shared some of my yellow kitties (click again to see them). My original plan was to make a French Provencial quilt and call it "Les Chats." To me French Provencial is blue & yellow. I made FAR too many kitties. (click for the free pattern) I still plan to make a French Provencial quilt out of my kitties - but it will probably be made with only the cats who are blue & yellow, not those that are blue or yellow. I made enough to use the ones made with a Judaic print in a quilt by themselves and call it "Chatoolim" - Hebrew for cats. You see I easily have enough for 4 quilts... I pieced them out of all of my prints that are blue, yellow or blue & yellow - which is a lot because that is one of my favorite color combinations. The first one was my friend's work party - she's not married or dating, so she brought me. One thing to remember when you go to a party - don't sit with the event coordinator. I'm just saying. The other party was a "Blue State Virginia" party... Lively political discussion comingled with foodstuffs in blue - blue cheese pizza, blue champagne, Labatt's Blue, etc. The next one is for my (small) office & it is pot luck. I bring that up because, I thought it was last week & brought my dish in last week accordingly... Now I am going to have to make something different... (I don't "have" to but I definately want to bring something different.) Then on Thursday is my (BIG) office party to which I do not have to bring anything - YAY! & Finally my husband's office party on Thursday night is catered. (Since I am a civil servant, our parties are only for the office folks, so my husband does not get to come to mind and hear the "yay us" speaches.) My hubby also has a (small) office party by himself too. If there are - you guys stay safe! Barb at Woofnanny, shared a recipe (that she found on yet another blog - I have gotten severly lost in blogville!) for pumpkin bars... I only tried them becasue they only needed the 1 cup of pumpkin that I had leftover from my pumpkin pie recipe! They are yumm-o! Project A (Homework assignment 1) is completed & turned in! Now I just need to present it on Monday. Project B (Homework Assignment 2) is further along... Up from 6 pages to 8 & I still have ideas/notes on how/where to add more. Which is a good thing! Project D (More gift pruchasing) I know what & where & even when to get the gifties for my mini-group members! This afternoon at the LQS where we meet every 3rd Sunday of the month. Is it a quilt made by a Jewish person? Or is it a Quilt with Judaic prints? For example, May Britt sent me one of her Norwegian Cat quilt patterns. When I make it will it be a Norwegian quilt? Or If I were to do one of those whole quilts that the Welsh are known for, would it still be a Welsh quilt? Conversely, if an Amish lady used Hanukkah prints to make a Quilt, would it be a Jewish quilt? 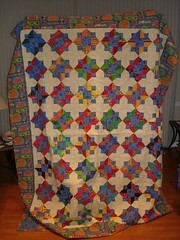 Or if a Jewish lady make a Christmas quilt as a gift, would it be a Jewish quilt? What is a Jewish lady made a quilt using Kente cloth - would that be Jewish quilt? Would it be an African Quilt? Yes, that is how I did it to myself... I have procrastinated the heck out of my assignments. (I hope to do my budget presentation during my lunch hours, since I do not have power point at home.) & Now I have an opportunity to see an old friend whom I have not seen in ages for dinner tonight. (I am on the fence about going, but closer to going than not....) I have a holiday party Friday night (sleep over at my GF's afterwards) & a "Blue" state Virginia Party on Saturday night. All in all, I still "see" time to work on my papers with all of those commitments, but... If they are anything like last night, I could just be up till 1 a.m. watching TV with two cats on my lap! Here is an easy way to even get the smallest kids involved. Thoughtful Treasures That should be a direct link - the main URL can be accessed by clicking here NIH Children's Inn. One other though for the day - in light of my list of "quilts to make" etc. "If you want to give G-d a good laugh, tell Him your plans." That isn't the pattern, rather the blog link - which does have a hyper link to the free pattern. In the meantime, I sewed last night! YES I DID! I am doing a faux log cabin (free pattern, you can google it - I can't hyperlink it.) I did the first seams last night, now to press and cut and sew again.